SECRET WEAPONS #2 ALLIANCES II VALIANT 1993 NICE!!! Secret Weapons #2 - Valiant - October 1993 - Alliances II - Joe St. Pierre. 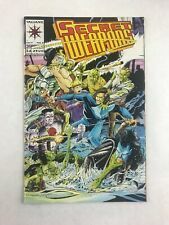 Secret Weapons # 1 and 2(Valiant 1993) NM 2 for 1 price! Secret Weapons #1 (Sep 1993, Acclaim / Valiant) (6 Copies for the Price of 2)!!! Lot Secret Weapons Comics, #1x2 (one signed by St Pierre), 2, 3x3, 4, 3x5, 5, 8.